In the 6WINDGate software architecture, the control plane and data plane are separate. 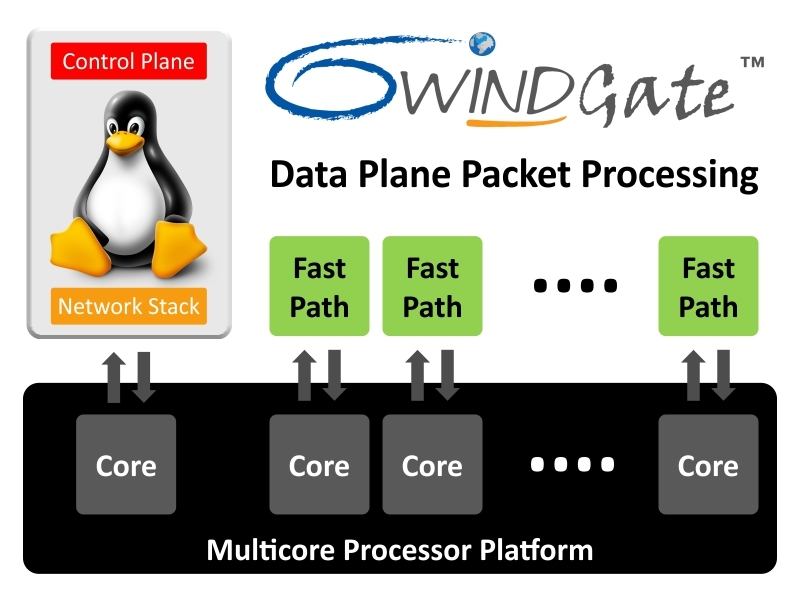 Within the data plane, the 6WINDGate fast path runs isolated from the Linux operating system on a dedicated set of processor cores. The fast path protocols process the majority of network packets without incurring any of the Linux overheads that degrade overall performance. The fast path implements a run-to-completion model whereby all cores run the same software and can be allocated as required according to the necessary level of packet processing or Linux application performance. Only those rare packets that require complex processing are forwarded to Linux, which performs the necessary management, signaling and control functions. Packet processing information that is configured or learned (through control plane protocols) in Linux is automatically and continuously synchronized with the fast path so that the presence of the fast path is completely transparent to Linux and its applications. This optimized architecture is ideal for high-performance networking systems in which the vast majority of the processing workload is data plane packet processing, rather than control plane and signaling functions. By using a Linux userspace model for the fast path, the system can be reconfigured dynamically as traffic patterns change in order to optimally share the CPU resources allocated to the control plane and the fast path.